Are you looking to preserve your favorite memories in a creative way? 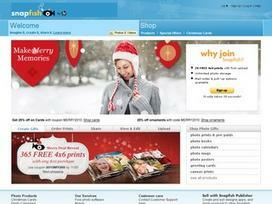 Snapfish is a fun online store where you can order digital photo prints and gifts online. Snapfish is by HP and has over 90 million members worldwide. Since 2004, Snapfish has expanded to 22 countries worldwide, making it the largest international photo service in the world. The company's mission is to help you preserve, enjoy, and make the most of your memories, while providing the best value at the same time. To get started at Snapfish, you simply sign-in for free with your e-mail address and start to upload the photos you would like to use in your project. You can edit your photos right there on the website so it is fast and easy. Then you simply choose from the many different gift ideas they have to offer. There are photo books, photo cards, photo calendars, photo mugs, photo posters, canvas prints, photo prints, photo notebooks, photo blankets, photo magnets, photo mouse pads, photo t-shirts, and many other options to choose from. Feel free to get creative. If you choose to buy your photo prints from them they have a great tool that will tell you if your photo will print well in that size. That way you don't get grainy looking photos. You are guaranteed to get the best photos possible. The prices are very low so Snapfish is a great website for the money conscience. You can choose to have your photo prints delivered to your door through the mail or you can pick them up at an affiliated store near you if you need them soon. The best quality photo is guaranteed either way. Maybe you are looking for a great photo book to remember the perfect vacation you just took, or an amazing birthday party, or a wedding perhaps, or maybe the birth of your first child. Snapfish has a wonderful variety of sizes and styles of photo books for great prices. You get to choose the style of photo book that suits you and your occasion best, then you pick the background photos you'd like to use either from their selection or you can use your own, choose the format you'd like for each page (this is a fun place to get creative), then you add your photos to create the perfect book that you will cherish forever. You can create a mug that tells your story with a picture collage, make personalized stationary, or design a beautiful calendar to share with friends and family throughout the year. At Snapfish photos are more than just prints and memories, they are treasures. Create your personal treasure today at Snapfish. Can be combined with coupons. So terrific for printing and amazing prices. Got our Christmas cards from here this year and they looked great.